Switzerland: The Nation with No Air Force? The Swiss air force is down to just 10 ready fighters with full-time pilots. The crisis is the result of the Swiss public's decision in a 2014 referendum to reject the air force's proposal to buy 22 new fighters. Now the Swiss air arm must make do with fewer planes and keep those planes in service longer. The knock-on maintenance effects drastically have reduced the number of available planes. The Swiss air force as recently as 2018 possessed 30 F/A-18 Hornets and 53 F-5E/F Tigers. Full-time pilots fly the Hornets. Part-time reservists pilot the F-5s. The air force acquired the Tigers in the 1970s and the Hornets in the 1980s. In 2014 the air arm proposed to replace the Tigers with 22 Swedish-made JAS-39 Gripen fighters at a total cost of $3.1 billion. But 53 percent of the Swiss public voted against the acquisition. The air force proceeded with its plan to retire the F-5, however. The U.S. Navy and Marine Corps, which already operate dozens of former Swiss F-5s in the adversary role, have expressed interest in buying the Tigers that retire in 2019. With the F-5 force shrinking and flying part-time, the Swiss air force increasingly relies on its 30 F/A-18s. Switzerland in July 2018 began a new effort to buy a replacement fighter. The JAS-39, the Eurofighter Typhoon, the Dassault Rafale the Boeing F/A-18E/F Super Hornet and the Lockheed Martin F-35 Lightning II reportedly all are contenders. But this new fighter is still years away from entering service. And that's assuming another public referendum doesn't interfere with their acquisition. With no new fighters joining the force anytime soon, the Hornets must fly potentially for decades longer. To last that long, the F/A-18s need structural upgrades. And that's what's driving the fighter shortage. 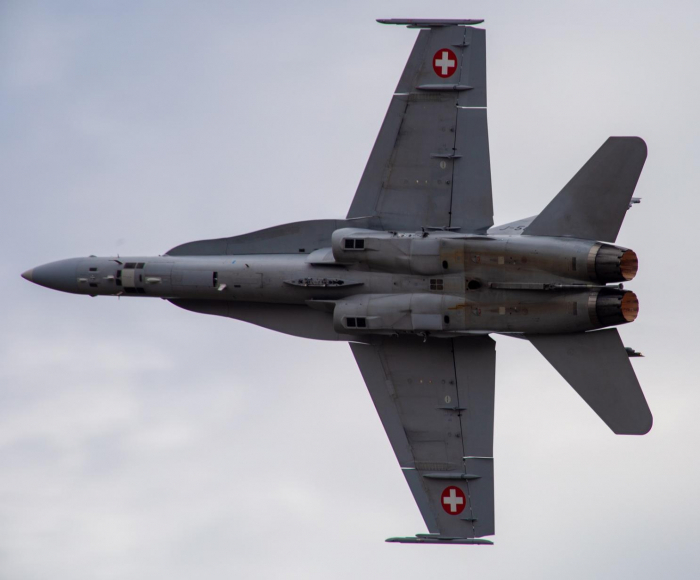 The Swiss parliament approved a service-life extension for the F/A-18 fleet that should extend each jet's lifespan from 5,000 to 6,000 flight hours. "The Swiss company RUAG ... has upgraded a first aircraft as a prototype in the summer of 2018," Scramble reported in April 2019. "This job was done within four months. However, for the next five Hornets, this work will take much longer than expected. This is due to previously unknown and only partially resolved problems from the production period at the end of the '90s." "For example, some replacement parts are not identical to the existing structure, so, a redevelopment of these parts is necessary," Scramble explained. "This structural redevelopment will also affect the rest of the F/A-18 fleet, as the delays at RUAG will block capacity for regular standard maintenance work." The work has left just 10 Hornets in service. "Two aircraft were constantly on quick-reaction alert and four aircraft were participating in the Frisian Flag exercise at Leeuwarden [in] The Netherlands. So four aircraft were available for regular tasks like training. The Swiss air force and RUAG are doing everything they can to increase the readiness, as both have stated." The Swiss air force isn't the only air arm that's likely to suffer an extreme shortage of airframes. Many European air forces are replacing their existing fighter fleets with much smaller fleets of new F-35 stealth fighters. Belgium is buying 34 F-35s for $4 billion to replace 56 F-16s. The Belgian air force expects just five F-35s to be deployable at any given time.